Don’t let your eyes be your handicap! How Do I Use Nature's Tears EyeMist? How Often Should I Use Nature's Tears EyeMist? 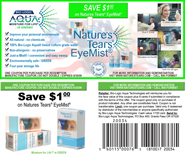 What Is The Difference Between Nature's Tears EyeMist and Eye Drops? Can I Use Nature's Tears EyeMist After LASIK Or With Contacts?